We are all know our environment is build of different types of plants and animals starting from tiny ant to shark with tones of weight. Like that several millions of organisms are living in our earth. But all organisms do not live in the same environment. Some organisms live in water, some in land and few in deserts. According to the environment the organisms have special structures and functions. Various types of plants, animals including man and microorganisms live in our planet. These constitute the Ecology. Directly or indirectly plants are the sources of food for all other kinds of organisms. No life is possible on Earth without plants. Animals are used in agriculture, dairy farming and for pulling the carts. Thus plants and animals are useful in many ways. A classification is essential to know about all these kinds of organisms and for better understanding about Bio-diversity. The word virus is derived from Latin. Virus means ‘poison’ or ‘venom’. The virus can be seen only under electron microscope. The virus is responsible for many diseases in plants and animals like common cold, mumps, small pox, chicken pox, jaundice, flu, fever, polio, rabies and AIDS. Virus lives and multiplies only inside the living cells. So they are called obligate parasites. The branch o science that deals with viruses is known as ‘virology’. Viruses are 50 times smaller than the smallest bacterium. In 1796, Edward Jenner controlled the viral disease called small pox by vaccination. At that time the causative organism for the small pox namely virus was unknown. In 1892 a Russian scientist Dimitri Iwanoski published his findings on Tobacco Mosaic Virus (TMV). The tobacco mosaic virus infects the tobacco plant. He observed the occurrence of dark green patches on leaves of infected plants. He called this disease is mosaic disease. After several investigations he discovered that virus was the cause of mosaic disease in tobacco. He named the virus as tobacco mosaic virus (TMV). On 1983-84, Robert Gallo and his associates in USA discovered the HIV viruses that cause the disease, AIDS (Acquired Immuno Deficiency Syndrome). It is a recent discovery of great importance. An intact virus particle capable of causing a disease in a particular host is called a ‘viron’. Viruses are made up of nucleic acids and proteins. The nucleic acid is called ‘nucleoid’ and the protein coat is called as ‘capsid’. The protein sub units of capsid are called capsomers. The capsid and the sub unit’s capsomer may be compared to a brick wall and bricks respectively. DNA (Deoxy Nucleic Acid) or RNA (Ribo Nucleic Acid) acts as hereditary material. Plant viruses possess RNA. Animal viruses and bacteriophages possess DNA. The tobacco mosaic virus is cylindrical shaped. It appears under electron microscope like a bunch of graphs. It has RNA surrounded by the protein coat. Viruses are very small and can be seen only under electron microscope. Viruses are measured by the unit nanometer (nm) or millimicron. The size of the viruses ranges from 17 nm to 300 nm. 1 millimicron = 1/1000 micrometer. Satellite virus is the smallest plant virus. Potato virus is the biggest virus. Viruses do not multiply outside their host. They lack metabolic activities. They can be crystallized. These are the non-living characteristics of the viruses. Capable of multiplying inside the living host, presence of DNA and protein coat is the living characteristics of viruses. Viruses cause various types of diseases in plants and animals. Plant diseases: mosaic disease, Bunchy top disease, Leaf roll disease, Yellow disease, Pox disease, Foot and mouth disease. Human diseases: AIDS, Jaundice, small pox, chicken pox, polio, rabies, mumps, common cold, etc. AIDS is a killer disease. Specific medicine for AIDS has not yet been discovered. But a drug called Azitothyamidine (AZT) is used to prolong the life of the affected person. Bacteria are considered as first formed organisms in the world. Except one or two types of bacteria, others do not have chlorophyll pigment. So majority of them obtain their food from other living organisms, dead plants and animals substances. They live as parasites as well as saprophytes. Some bacteria also lead symbiotic mode of life. 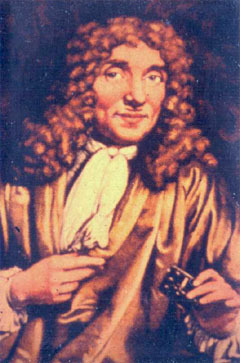 In 1675 Anton Von Leewvenhoek, a Dutch scientist, discovered bacteria. He called the bacteria as ‘animalicules’. The branch of science that deals with the bacteria is called bacteriology. Anton Von Leewvenheok is called as the father of bacteriology. Bacteria are found in water, air, soil, sewage, food materials and they also live in plants and animals as parasites. Each bacterium is made up of single cell. They spread through water and air. Some bacteria possess hair like structures for movement. The hair like structures found on the surface of the bacterium are called flagella. The number of flagella and their arrangements differ in various types of bacteria. Well-defined nucleus and nuclear membrane are absent. Cytoplasm is present. Choloroplast is absent. RNA is present. A thick covering present around the cell wall is some bacteria is known as capsule. Size of bacteria: Bacteria can be seen only under the compound microscope. The width of bacteria ranges from 0.2-1.5 micrometer and the length from 3-5 micrometer. Many bacteria are useful in industries, medicines, recycling of waste materials and agricultural. A type of bacterium known as Leuconostoc is responsible for the fermentation o flour of dhosa and idly. Certain bacteria convert the domestic wastes into good manure. Bacteria are responsible for the tanning of leather and processing of tea and tobacco leaves. Bacteria cause many diseases in plants and human beings. In plants: Canker disease, Ring rot disease, Fire blight disease, and Wilt disease. In man: Diphtheria, Plague, tetanus, Cholera, Tuberculosis, typhoid, Leprosy etc.